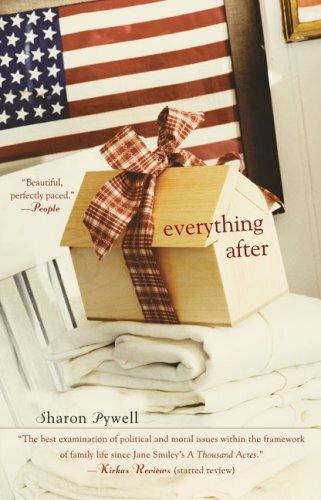 Everything After by Sharon Pywell is your basic family drama centered on the Sunnaret family after their sons are allegedly killed in the Vietnam War. However, nothing is as it appears when someone from their sons’ platoon confronts the family and tells them that one of the brothers killed the other to save the rest of their groups’ lives. Now, Iris the youngest sibling goes on a journey to figure out the truth, however, doing so relieves secrets that her family was trying to hide specifically the mysterious death of her mother and why her father left her family leaving her and the other children in the care of their “aunt” and “uncle”. There is really not a lot I can say about this book. It did not blow my mind in any remarkable ways yet it was not horrible either. The characters were fine, the plot was fine but the writing was really messy at times. For some reason, this novel was difficult to read. There were often moments in the story where I had to reread entire passages to understand what the author was saying. Even the dialogue was choppy at times and the writing of the characters sometimes felt unnatural. It was clear from the dialogue that you were reading a novel and, at points, I was taken out of the story because of it. Because of this novel was so run of the mill, I really do not have much to say about it. Overall, I generally really enjoyed reading this novel. If the writing was better, I think I would have given this novel 5/5 stars. However, the writing was so all over the place that I had to give 4/5 stars. I bought this book because it seemed like an interesting storyline at the time - a family copes with their brothers’ (assumed) PTSD during Vietnam. I was in the mood for some family story and combining it with a Vietnam era plot (one of my favorite time periods in history), I figured it was a win-win situation!Only a few chapters in, I was thrilled with my $3.99 purchase (whoohoo Borders bargain bins!). It had decent character development and I was already hooked to find out what the deep dark secret with this family was. Then...I continued reading. I was disappointed when I finally DID find out what the 'deep dark' family secret was - and that it wasn't so deep nor dark. In fact, I pretty much figured it out before the author told me! I guess that’s why I was pretty disappointed.There were also some sibling relationships that were strained but never fully explained as to why they were strained (at least I thought so) Coming from a family of 5 kids myself, it’s interesting for me to see other families, whether fake or real, carry on despite it all. I got the impression that the author either didn’t come from a large family herself…or just didn’t portray large families too well. I felt like she left some relationships between certain siblings completely undeveloped - that bothered me a bit.Also, it wasn’t very believable to see the older sister in this novel suddenly become swept up in the counterculture of the era (drugs, communes, resisting “the man”, etc.). She was raised by conservative, military “adoptive” parents and seemed to have a decent relationship. Maybe I’m just being too critical, but that aspect of the story wasn’t very well developed. All of a sudden she just was something completely opposite from what she had been…not very likely in my eye.Maybe I’ll go back and give this book another shot one day, who knows. Honestly, I had about 5 other books lined up at the time and I just pushed myself to get this one over and done with! I'm not sure where this book came from but it jumped out at me from my bookshelf and I decided it was time for a read. I very much enjoy family dramas and this book fits solidly in that category. It's somewhat of a coming of age novel where the main character examines what is true about her family and somewhat of a mystery with many unanswered questions surrounding her family and their whereabouts. However, in the end the questions mostly remain unanswered and somewhat unsatisfying. As much as I love the drama between characters, it is sometimes tedious. I did love her characters and felt them to be whole and completely believable. Worth a read. This may very well be my all time favorite book. I have read it about four times. I find the story so inviting. The characters draw me in. They are all so unique. Going through the coming of age with this woman is lovely. All of the people she meets along the way have their own unique way of helping her. She deals with quite a bit of lose over the course of her life. She handles it better than all of her siblings. Just when you think she might get lost she finds her center. I love this book and just cannot say enough good things about it. HO-HUM. The premise of this book sounds fantastic and while the writing is good (i.e. no glaring grammatical issues, the story is easy enough to follow) it plods along like a donkey bogged down with a tons of rocks. I set this book down to read my monthly literary magazine and after reading the 'zine, this book looked a bit like chopped liver. I couldn't even stand to pick it up again. I didn't really care at this point what happened to the characters, what they felt, who they killed or screwed or loved or hated. BLECH. This book's summary made it sound intriguing, but it was rather blah and slow-moving. It's the story of four siblings who are raised by an "aunt" and "uncle" who were close friends of their parents. The two brothers go off to war and don't come back, and the youngest sister realizes things about her family she never noticed before. I thought there would be some big horrible secret at the end of the book, but there wasn't and it was very disappointing. An interesting look at young adult life during the Vietnam War -- my mother´s generation -- and how it caused generational and moral rifts through families. Although, this storyline was more complicated than that. Though I felt the plot itself was a bit awkward, I felt that the writing itself was strong and sometimes that makes a big difference. This is my favorite of the three books I've read for my book club. The characters really evolve and come to life through the eyes of the youngest member of the family. Her own point of view matures as her understanding of the events unfold even through the distortion of time, the sometimes unreliable and/or varying stories, and her own perceptions and preconceptions. okay----i kept getting lost and wondering why this was important. about a family lossing their mother and losing the sons in the Vietnam war, an absent father , and strict thinking about politics from the uncle who took the kids in. It took work to stay with it. I cannot remember the details of this book but I do know I enjoyed it. OK...took a while to get into it. By the end, I was hooked into the plot and had a hard time putting it down. But, overall, just OK.
Do not read many novels but the search for what happened to her brothers in Vietnam held my interest. It was a good read. A little Dissapointed at the end. Would have liked some more info..